Having a pressure washer for your home can be incredibly helpful when it comes to getting better results for outdoor cleaning. However, the costs can quickly add up. An excellent commercial pressure washer doesn’t come cheap, but buying a top brand like Karcher or Generac will benefit you in the long-run. One way you can easily save money after your purchase is by making your own homemade pressure washer detergent. 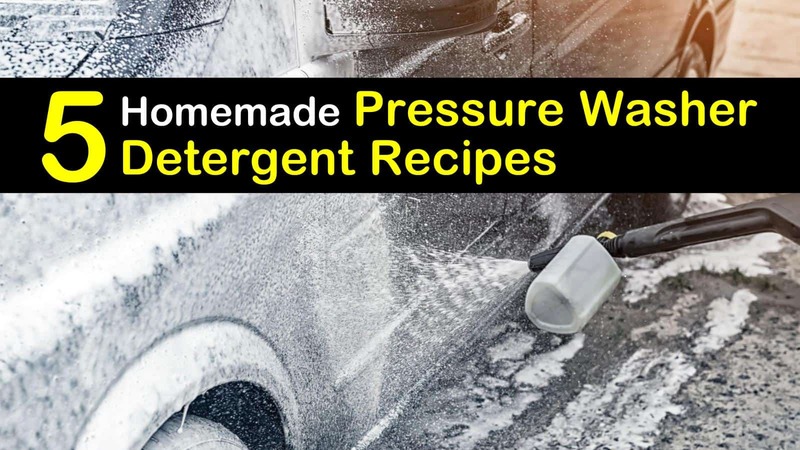 By making your own pressure washer detergent, you not only have more control over how much you spend, but you also have more awareness of the ingredients you’re using. Not all cleaning products are created equally, and by making your own power washer soaps, you can make sure you’re not using any materials that may damage your property or yard. Here are our five favorite homemade pressure washer soap recipes that you can use around your home. Cleaning concrete flooring and other hard surfaces require a bit more than a simple pressure washing with high-pressure water alone. You’ll get better results if you add this DIY power washer detergent to your cleaning process. Pour a gallon of water in a large bucket and then add Borax and washing soda. Add in the dish soap and stir thoroughly. Before using the pressure washer soap, make sure to do a quick preliminary clean of the area, moving any significant debris or outdoor furniture. This incredible do it yourself cleaning solution is cheap and easy to make. Before you start mixing this general purpose cleaner, put on some gloves and goggles for extra protection — you don’t want to get any ingredients in your eyes. Start by combining the laundry soap and the all-purpose cleaner, and allow them to set overnight to ensure they combine correctly. The next day, mix the bleach and water in a large bucket. Add in the powder mixture, stirring constantly. Be careful not to stir too quickly, as you do not want to create suds. If you don’t plan on using all of your homemade pressure washer soap right away, you can store it in any clean, empty plastic container. Clearly label the container for future use. This recipe also makes a perfect DIY deck cleaner. This DIY pressure washer detergent for cars isn’t as heavy duty as some of the other bleach solutions on this list, but it gets the job done. The gentler cleaning detergents work better for cars, as you don’t want to risk damaging the paint or detailing. Mix the laundry detergent in a bucket of hot water, being careful not to stir too quickly. Clean your car with low pressure, so you aren’t doing any damage, and be sure to rinse it afterward with a garden hose to get rid of all of the cleaning detergent. With this recipe, you can make your own pressure washer detergent to use in more sensitive areas like gardens, or other spots with organic materials. Mix all of the ingredients in a large bucket, again being sure not to create too many suds. Regular cleaning with this general use detergent will help keep difficult stains and mildew away, but if you find you need a more heavy duty natural solution, you can put some white vinegar in your pressure washer and spray on tough areas. Gas pressure washers are a great way to clean vinyl siding without scrubbing. To make sure you get the best results, make your own washer soap. In a large bucket, mix all ingredients and then apply it with your power washer from the bottom to the top of your siding. After a few minutes, rinse the cleaner off starting from the top and allowing for downward water flow. 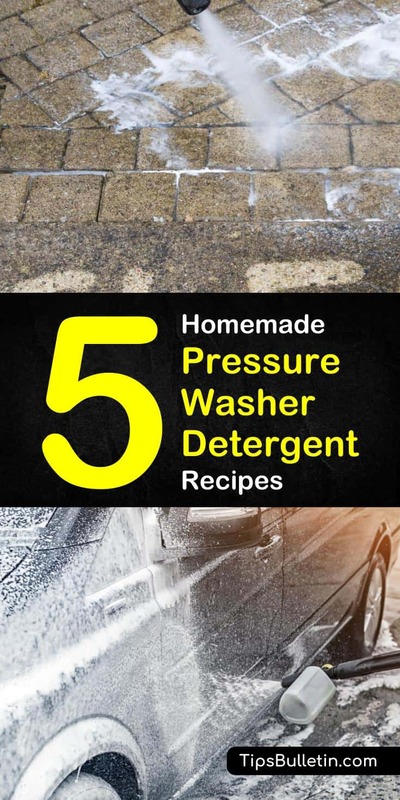 The most important thing to remember when using these homemade pressure washer detergent recipes is to make sure you’re using the proper water pressure and ingredients. As long as you take those precautions, the exterior of your home and cars will look cleaner than ever! We hope you enjoyed these pressure washer detergent recipes. If you have friends and family who clean with a pressure washer, then share these soap recipes on Facebook and Pinterest.